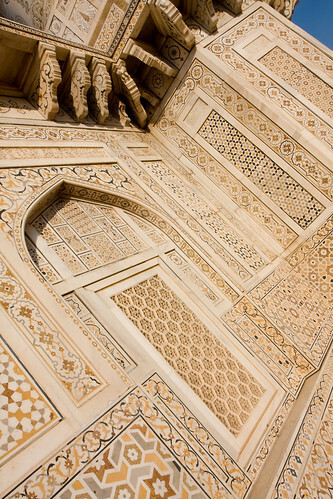 Photo by Claudia Yeh – Creative Commons License. 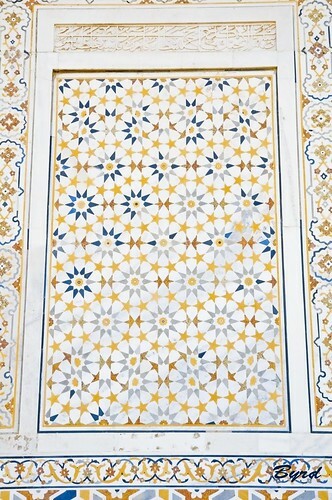 Etimad-ud-Daula’s Tomb (Urdu: اعتماد الدولہ کا مقبرہ‎, I’timād-ud-Daulah kā Maqbara) is a Mughal mausoleum in the city of Agra in the Indian state of Uttar Pradesh. 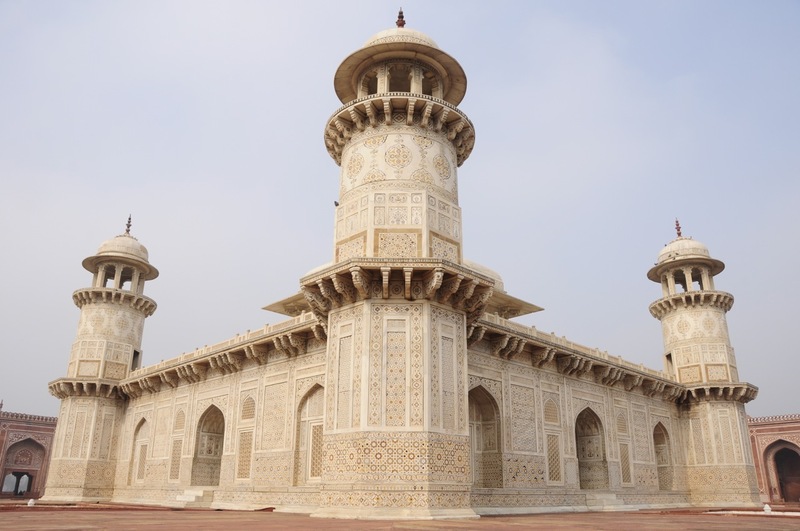 Often described as ‘jewel box’, sometimes called the ‘Baby Tāj’, the tomb of I’timād-ud-Daulah is often regarded as a draft of the Tāj Mahal. Along with the main building, the structure consists of numerous outbuildings and gardens. 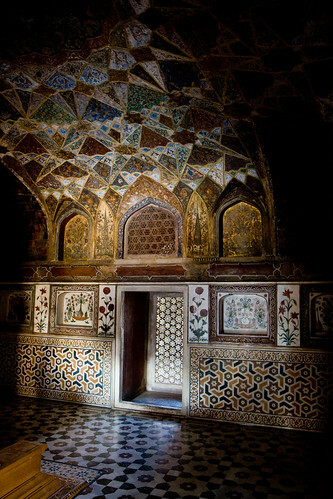 The tomb, built between 1622 and 1628 represents a transition between the first phase of monumental Mughal architecture – primarily built from red sandstone with marble decorations, as in Humayun’s Tomb in Delhi and Akbar’s tomb in Sikandra – to its second phase, based on white marble and pietra dura inlay, most elegantly realized in the Tāj Mahal. 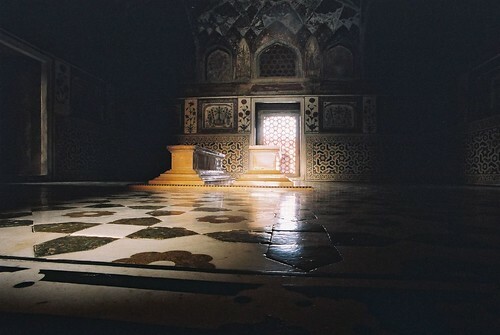 The mausoleum was commissioned by Nūr Jahān, the wife of Jahangir, for her father Mirzā Ghiyās Beg, originally a Persian Amir in exile who had been given the title of I’timād-ud-Daulah (pillar of the state). Mirzā Ghiyās Beg was also the grandfather of Mumtāz Mahāl (originally named Arjūmand Bāno, daughter of Asaf Khān), the wife of the emperor Shāh Jahān, responsible for the building of the Tāj Mahal. Located on the left bank of the Yamuna river, the mausoleum is set in a large cruciform garden criss-crossed by water courses and walkways. 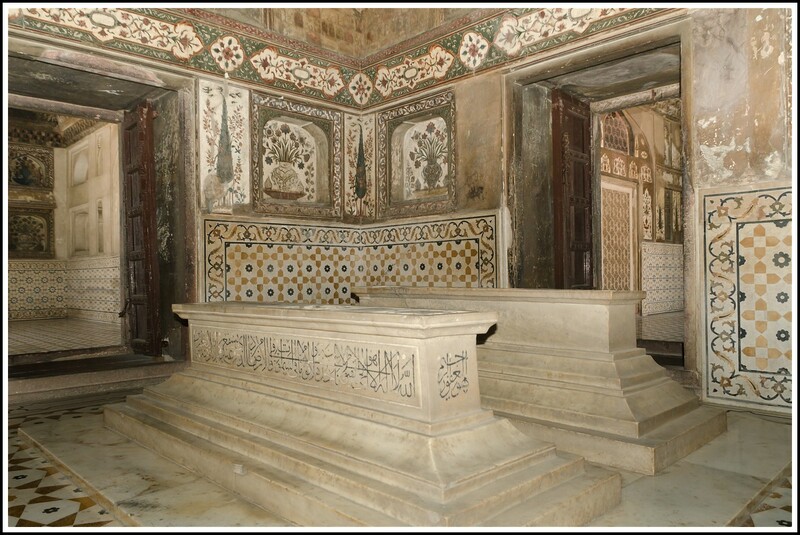 The mausoleum itself covers about twenty-three meters square, and is built on a base about fifty meters square and about one meter high. On each corner are hexagonal towers, about thirteen meters tall. 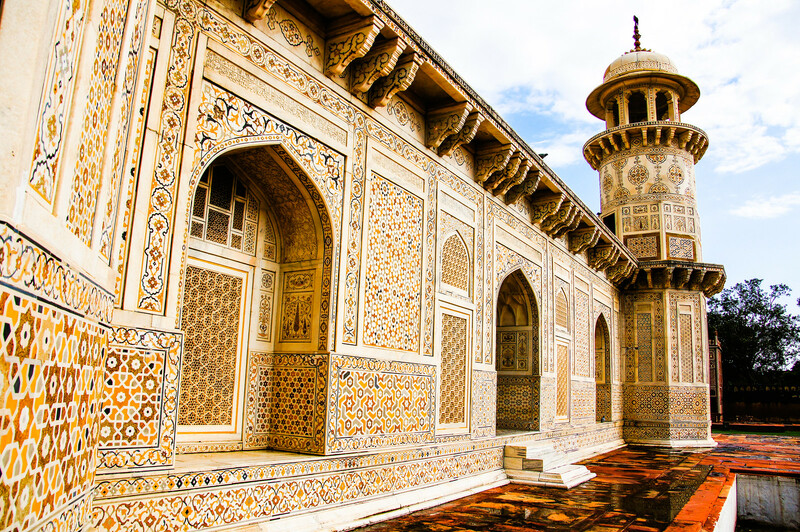 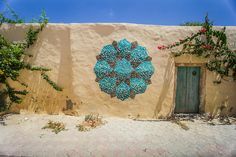 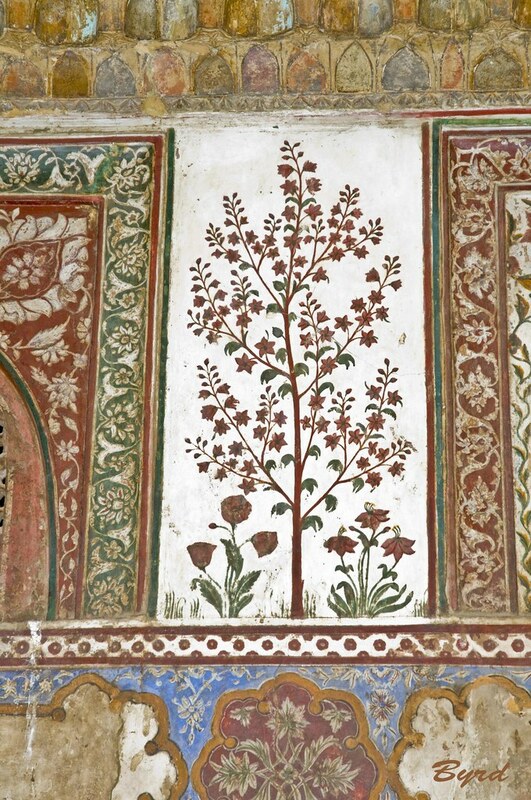 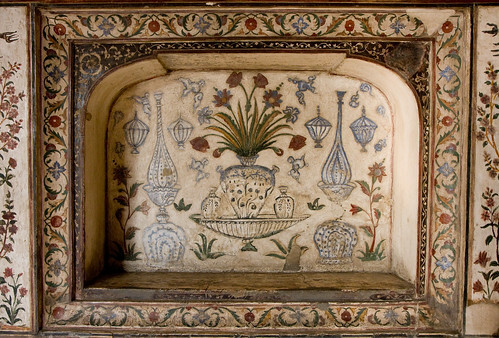 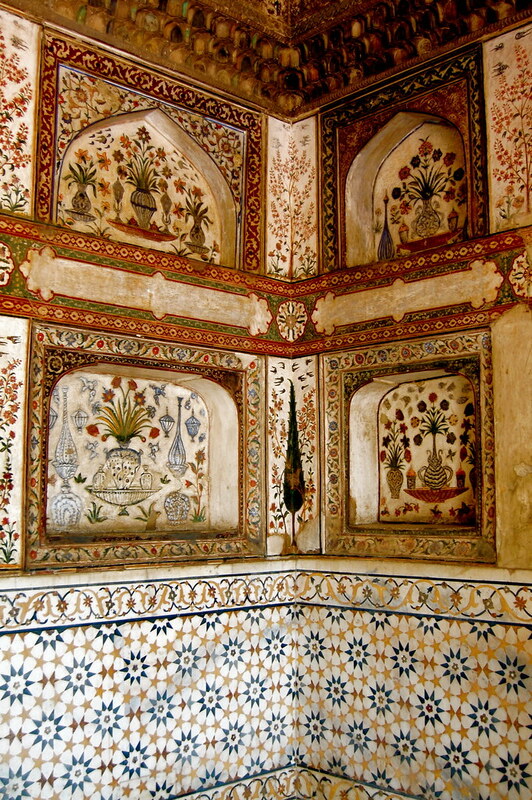 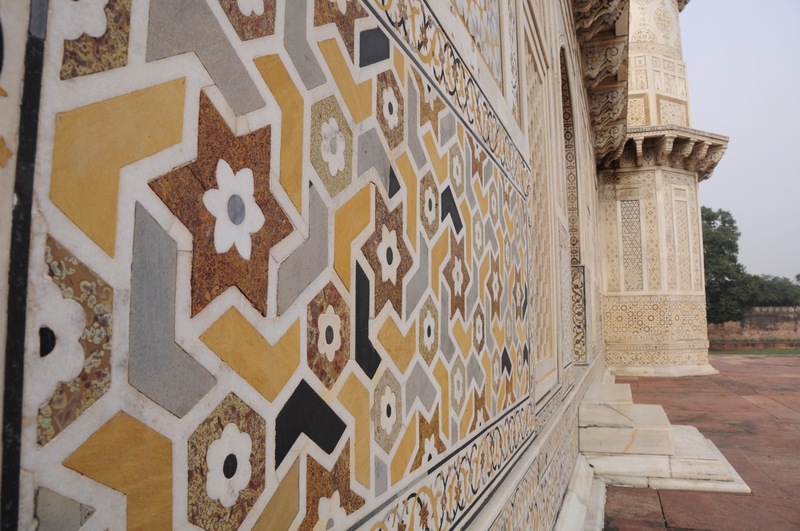 The walls are white marble from Rajasthan encrusted with semi-precious stone decorations – cornelian, jasper, lapis lazuli, onyx, and topaz formed into images of cypress trees and wine bottles, or more elaborate decorations like cut fruit or vases containing bouquets. 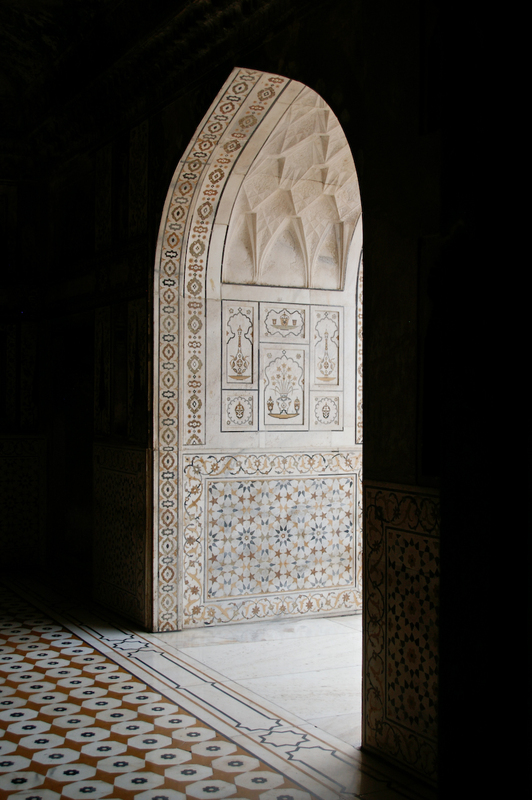 Light penetrates to the interior through delicate jālī screens of intricately carved white marble. 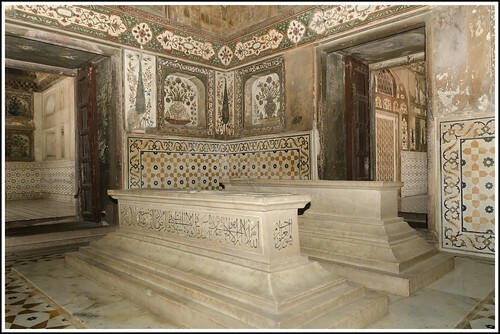 Many of Nūr Jahān’s relatives are interred in the mausoleum. 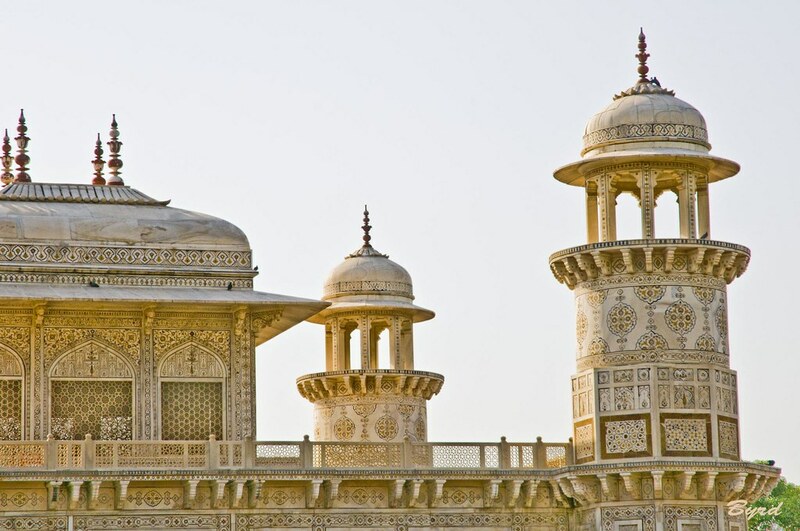 The only asymmetrical element of the entire complex is that the cenotaphs of her father and mother have been set side-by-side, a formation replicated in the Tāj Mahal. The tomb, situated on the eastern bank of the river Jamuna, is planned in the centre of a Char-Bagh (four quartered garden) with the usual enclosing walls and side buildings. 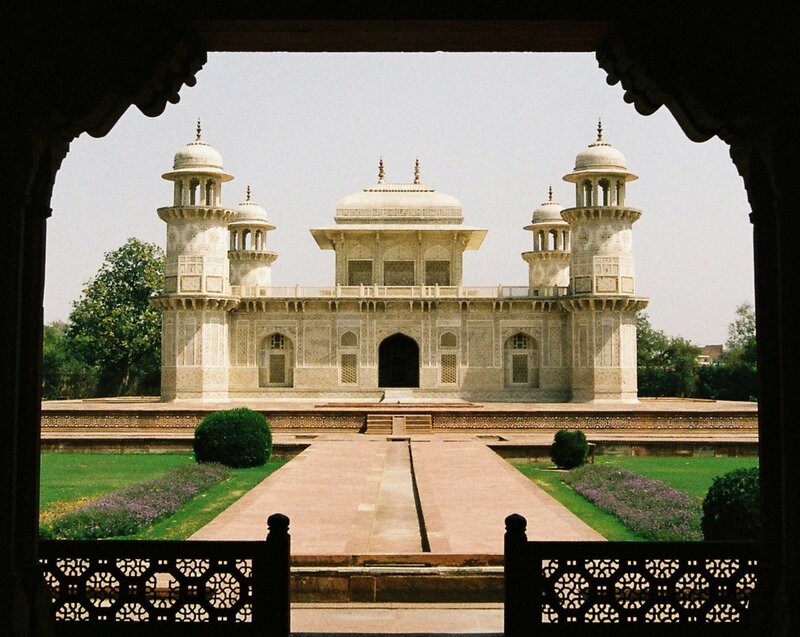 The main tomb of white marble, is marvelously set in the centre of this garden. It stands on a plinth of red stone having in the middle of each side, facing the central arch a lotus-tank with corners. Each façade has three arches, the central one providing the entrance, and the other two on the sides being closed by jalis. 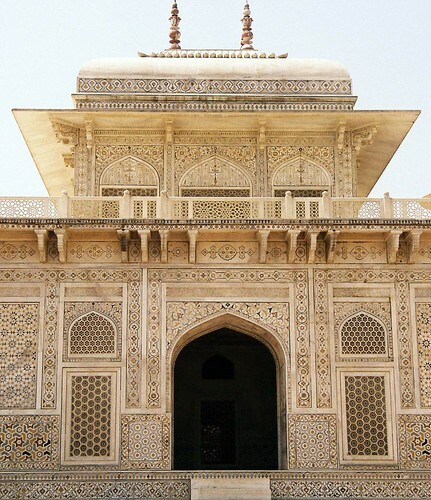 Each side is protected by a chhajja and jalied balustrade above it. 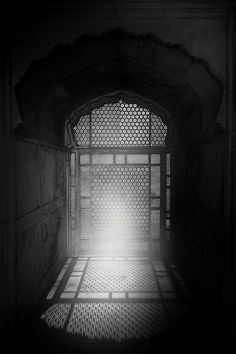 There is no dome. Instead, the building is roofed by a sqaure ‘Barahdari’ having three arched openings on each side which are closed by Jalis except in the middle of north and south sides. It is protected by a chhajja above which is the Chaukhandi (pyramidal) roof, crowned by lotus petals and kalash finials. 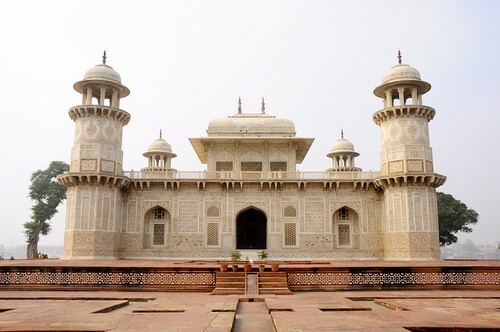 The interior is composed of a central square hall housing the cenotaphs of Asmat Begum and Mirza Ghiyas, four oblong rooms on the sides and four square rooms on the corners all inter-connected by common doorways. 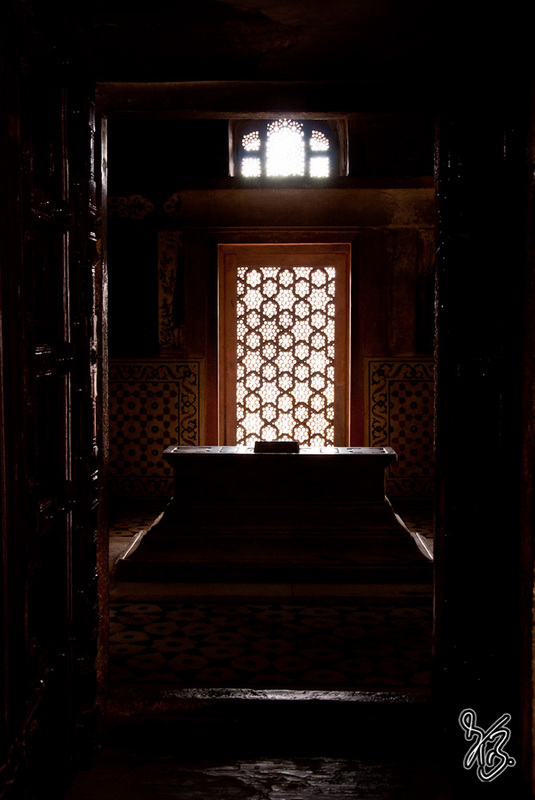 The cenotaph of Asmat Begum occupies the exact centre of the hall. 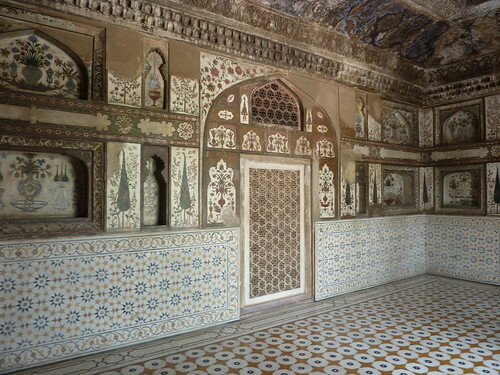 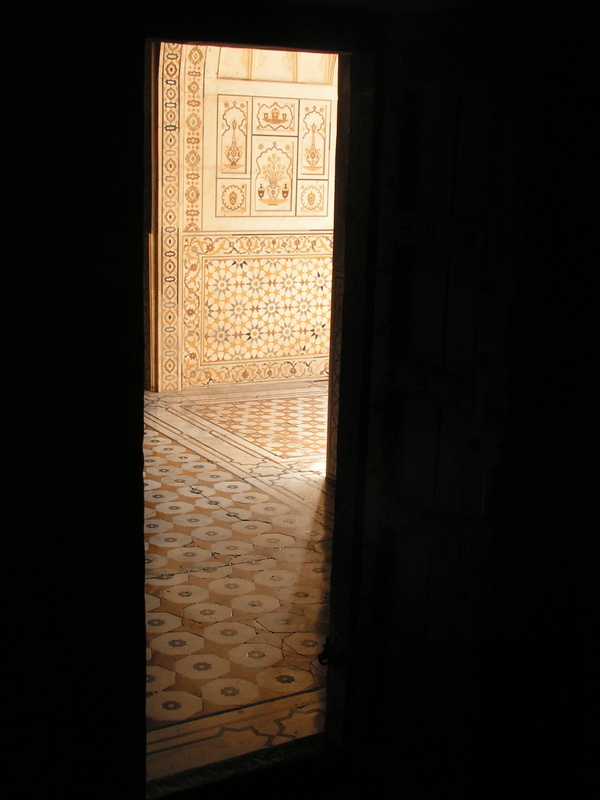 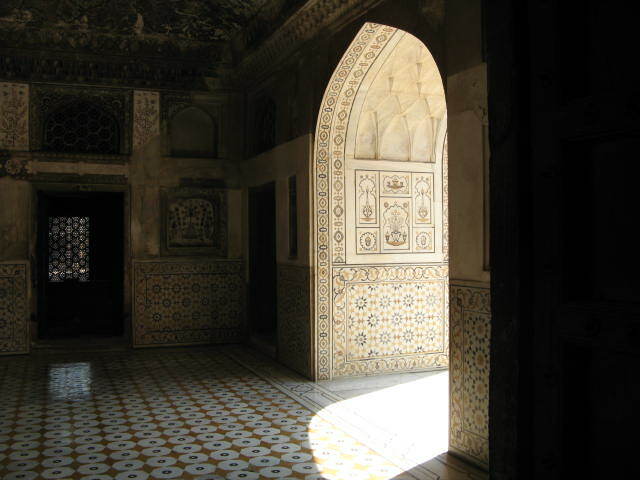 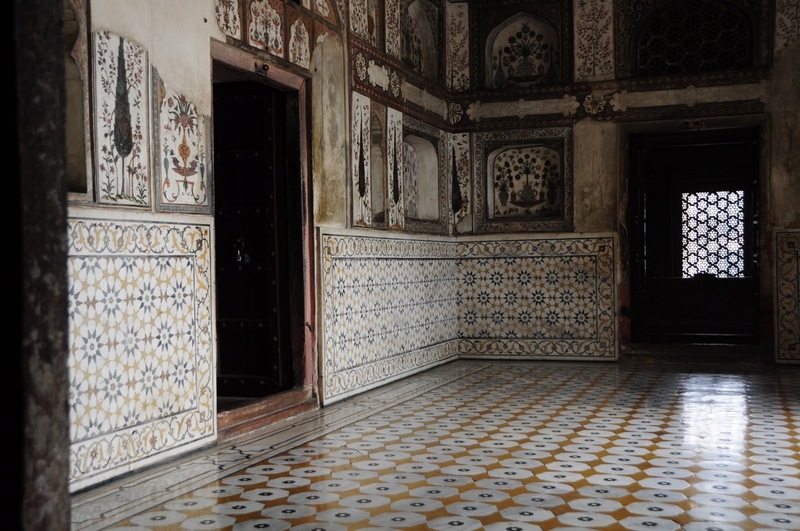 Corner rooms have tombstones of Nur Jejan’s daughter Ladli Begum and her other relations. 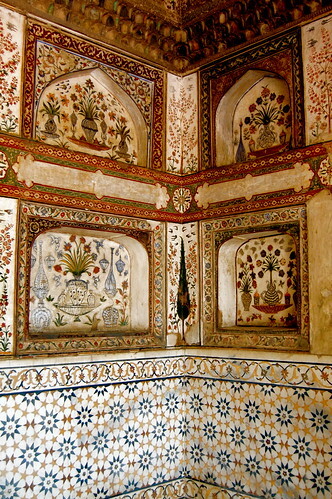 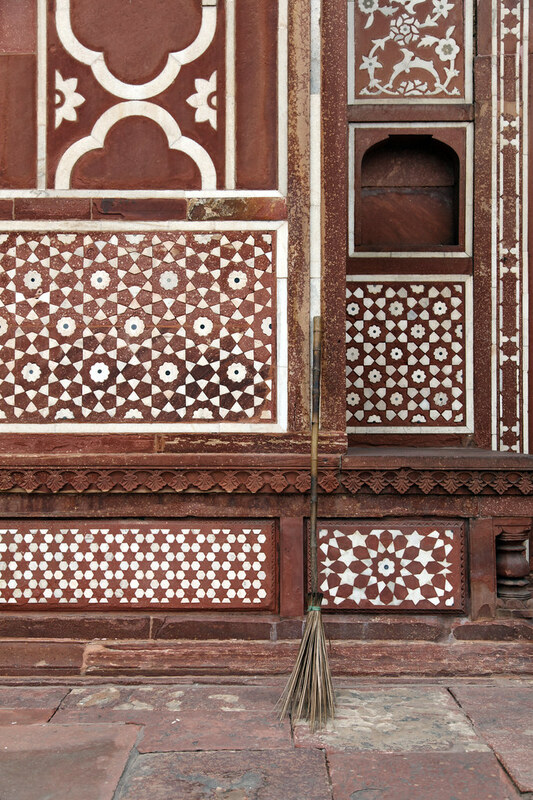 The most important aspect of this tomb is its polychrome ornamentation. Beautiful floral stylized arabesque and geometrical designs have been depicted on the whole exterior in inlay and mosaic techniques, in various pleasing tints and tones. 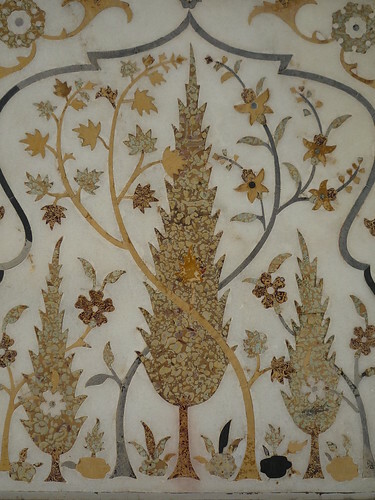 Wine-vase, dish-and-cup, cypress honey suckle guldasta and such other Iranian motifs, typical of the art of Jehangir have been emphatically used. 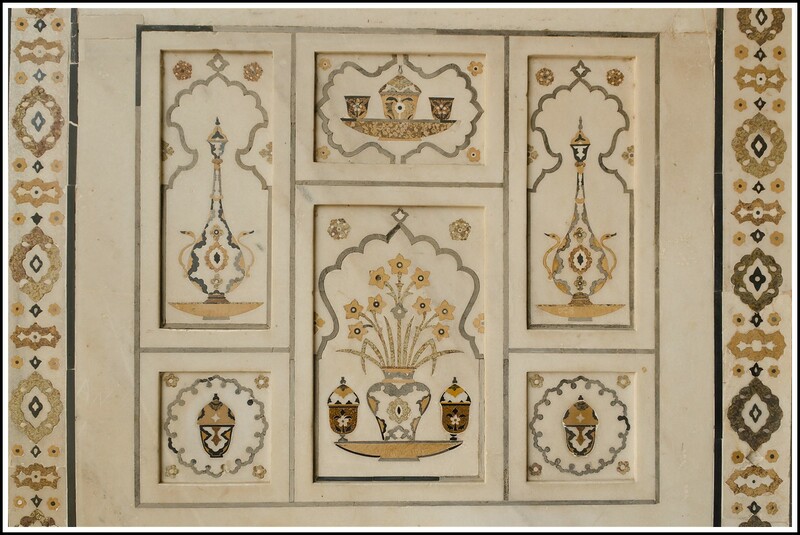 Some compositions have been inspired by the plant-studies of ‘Ustad Mansur Naqqash’, the famous ‘fauna and flora’ painter of Jehangir. 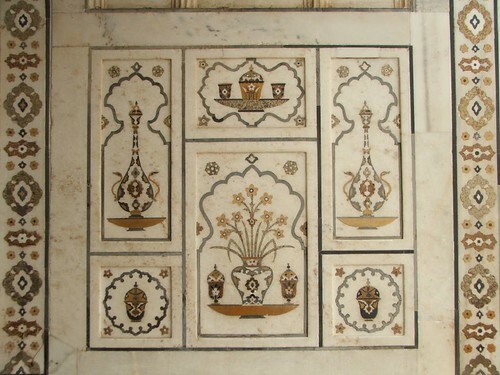 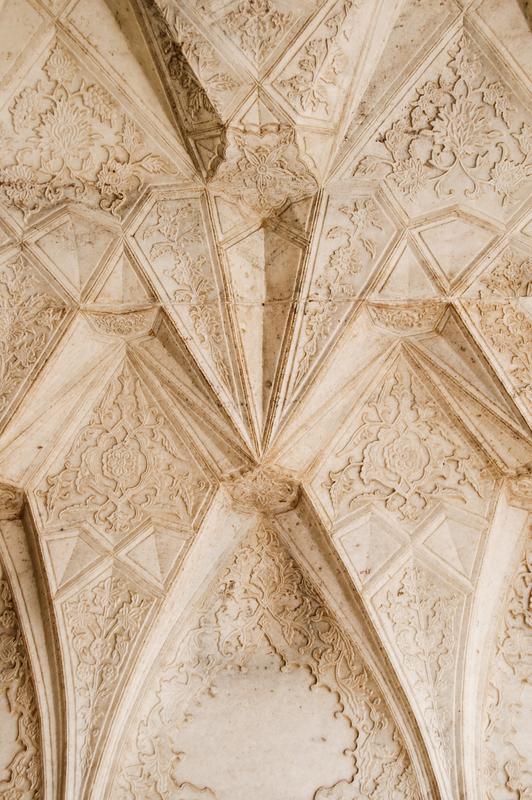 Some stylized deigns have also been done in exquisite carving. 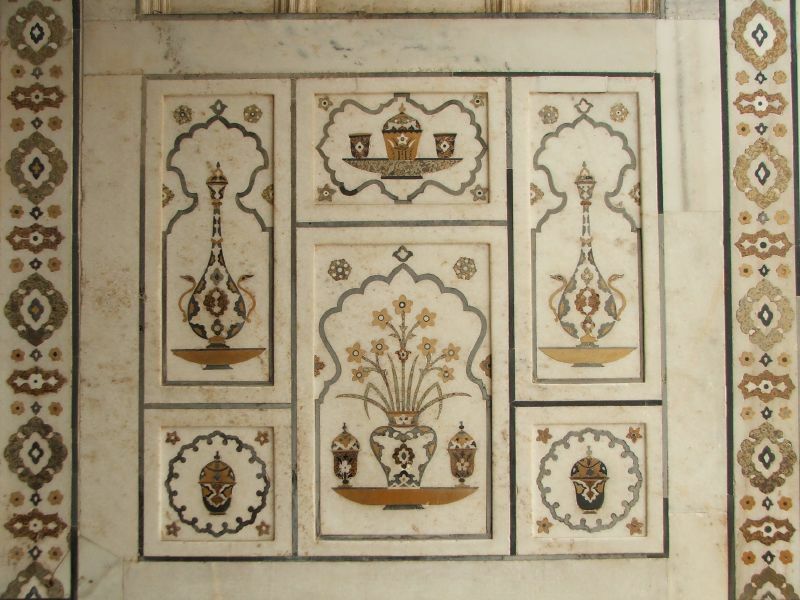 Both incised and relief, they look like embroidery work done in ivory. Delicacy is their quality. Stucco and painting have been done in the interior where minute animal and human figures have also been shown. The inspiration has come from the contemporary art of painting. 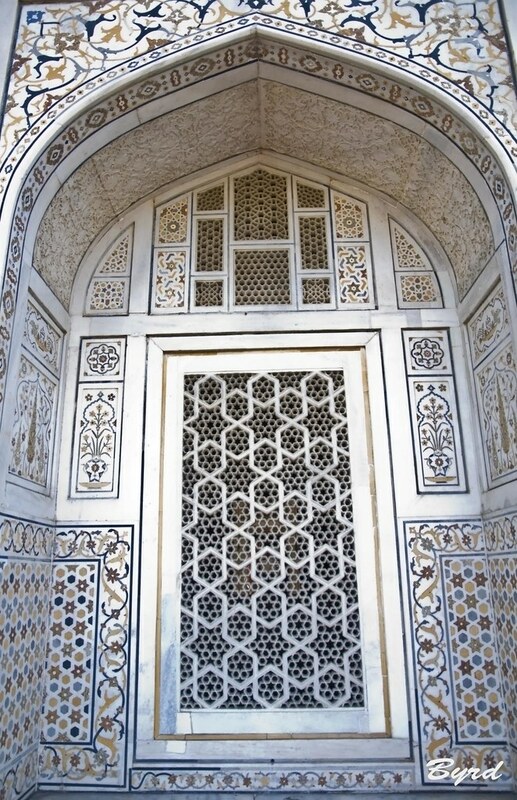 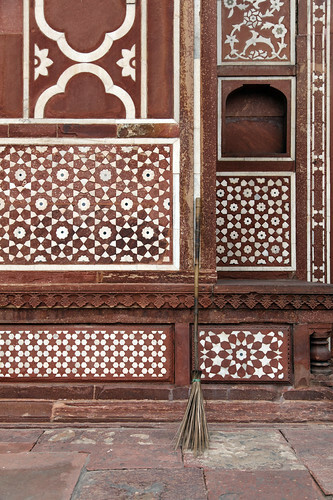 There is no glazed tiling and the decoration is largely by color stones which is an indigenous development. 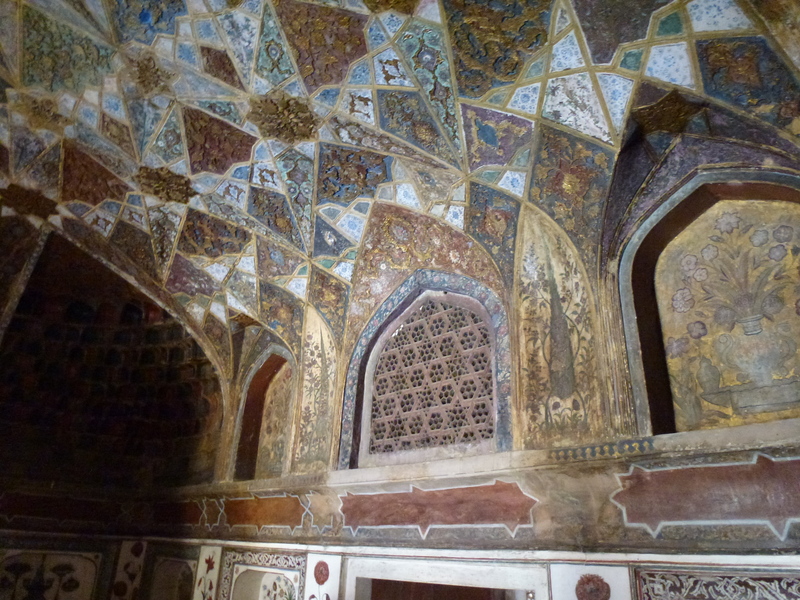 By far, it is the most gorgeously ornamented Mughal building. 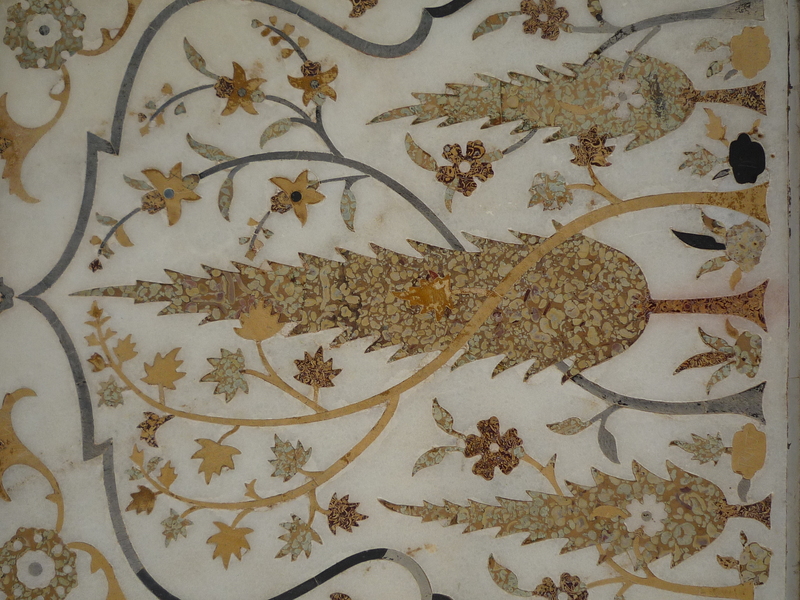 It testifies that the Mughals began like Titans and finished like jewellers. 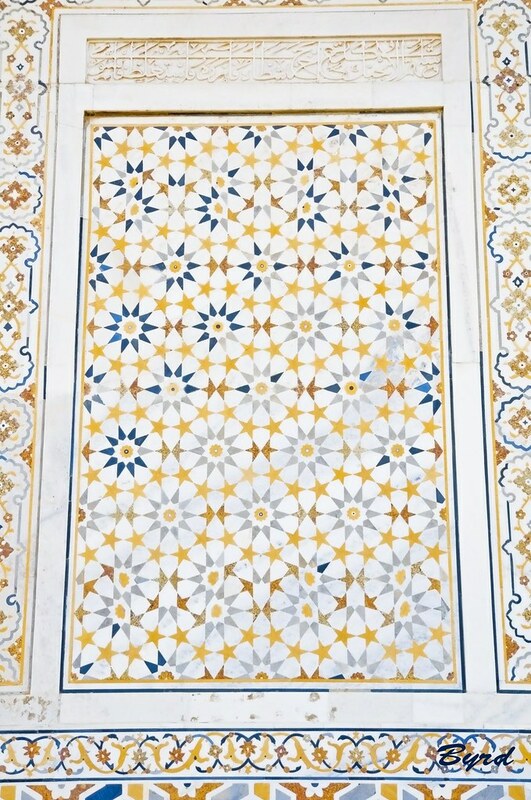 Chapters 48 and 73 of the Quran have been carved on the 64 panels on the external sides of the ground floor. 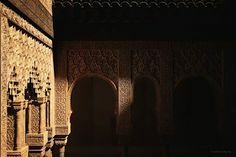 The date of writing A.H. 1037/ 1627 AD is mentioned in the last panel. 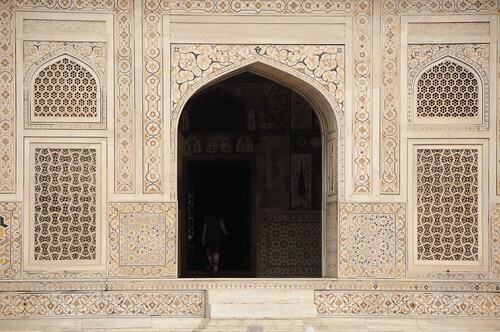 Chapter 67 of the Quran is inscribed on the 12 internal panels of the upper pavilion. 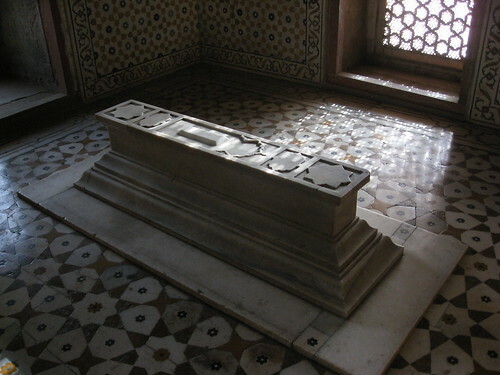 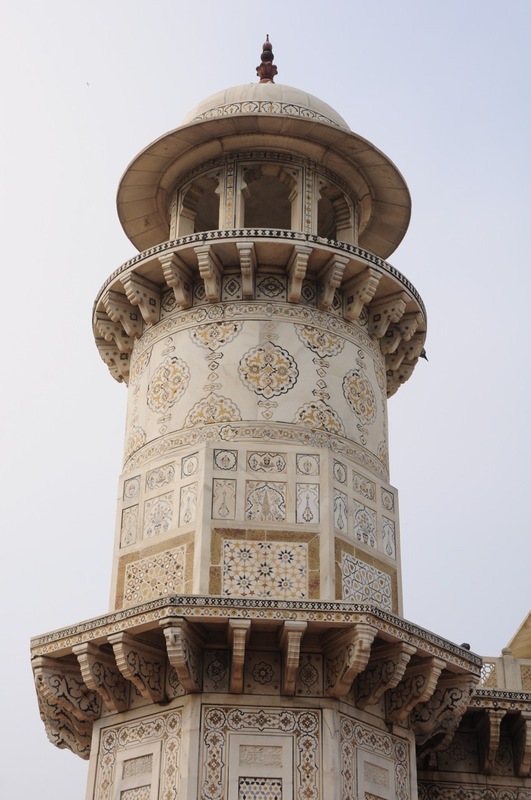 The tomb of Itimad-ud-Daula is a masterpiece of the domeless class of Mughal tombs. 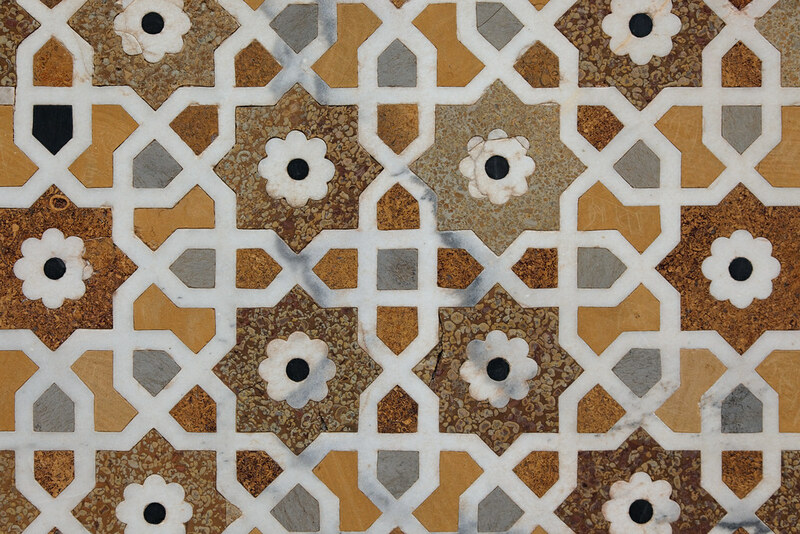 It is the first building finished with white marble and marks the transitional phase from red stone to white marble. 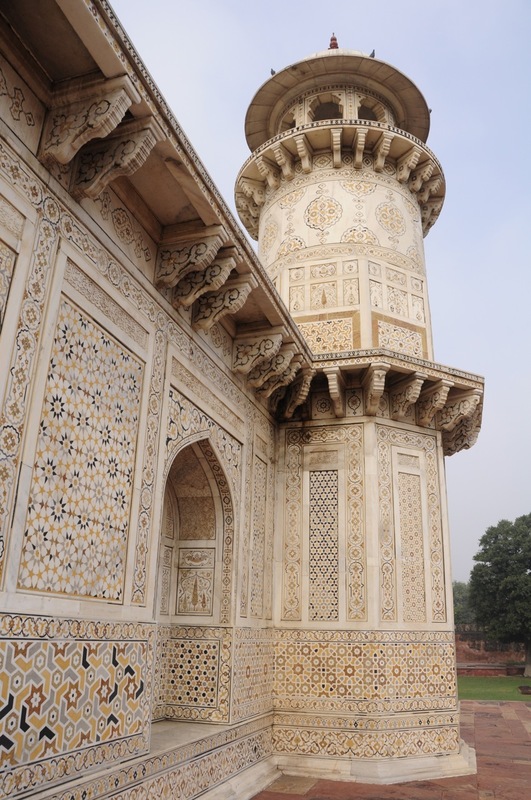 From Akbar’s tomb Sikandra to the Taj Mahal. It reflects the personality of the polished Iranian who lies buried here, and more than that, the formal and ornamental character of its builder Nur Jehan who ruled the Mughal empire from behind the curtain for 16 years (1611 -27). This is protected and conserved by the Archaeological Survey of India.